Leonardo da Vinci, Albert Einstein, Alexander Graham Bell, Sir Richard Branson, Walt Disney, Jay Leno, Whoopi Goldberg, Nelson Rockefeller, Agatha Christie, Steven Spielberg, Harry Belafonte, Winston Churchill, and Richard Strauss. These are the names that young Jackson “Jacko” Smith learned from his tutor at a young age. Famous people who have overcame their dyslexia to do something important for the world. He uses these names to help guide him through the decisions he makes in his life. What some would consider extraordinary, he sees as a nice, normal life. Diagnosed as dyslexic in pre-kinder, Jacko receives help from most of his family to overcome the disability. While his mother would not approve any special help, his father and siblings make sure he gets the extra help he needs. It is through his second tutor that he meets Samuel “Sammy” Collins. The two youngsters become best friends with Sammy helping Jacko out with his school work. As they progress through school, they must deal with setbacks life has for them. Between bullying, lost loves, and general anxiety about the future, the boys stay friends through the years. As they move on to adulthood, Sammy trains to be a teacher dealing with students with disabilities. Jacko takes a job with the city cutting lawns. His ability to think differently than most others will fuel his rise through the ranks until he gets to management. Along the way, Jacko realizes that he has feeling that are more than friends for Sammy, who has been out and proud his whole life. The pair marries and set off creating their life together, like any other Australian couple. What follows leads the pair to the pinnacle of Australian power, something neither of them imagined. This is a wonderful book that sets out the life of Jacko as he struggles with his dyslexia, issues with his mother, bullies, and xenophobic people. While this is a book about the lives of these two men, it also deals with several issues currently facing Australia specifically and other parts of the world. The author touches on monarchist, partisanship, foreigners, and the current debate on marriage equality in Australia. (In the book, the issue has been settled for several years.) The book also serves a mini-travelogue of Southeast Asian countries. If you want a book that deals with family dynamics, a touch of politics and a friends to lovers story, I highly recommend A Nice, Normal Family. The cover art by Maria Fanning shows the Collins-Smith family as I pictured them. Jacko, Sammy, Max and Kate are pictured in front of a harbor on the Australian coast. This entry was posted in 5 star Rating, Book Reviews, Books, Contemporary fiction, Dreamspinner Press, eBooks, LGBTQ Book Reviews, M/M Book Reviews, M/M Contemporary Fiction, M/M Fiction, M/M Romance, Uncategorized and tagged A Nice Normal Family by John Terry Moore, A Paul B HIghly Rated Novel, A Paul B Release Day Review, A Paul B Release Day Review: A Nice Normal Family by John Terry Moore, author John Terry Moore. Arik Bosler receives a call from Ken Brighton offering him a two week fellowship to study art with him in Northern Michigan. Normally Arik would be ecstatic about this opportunity. However, he was injured six months ago, severely burning his hand, making it impossible to paint. Arik agrees but decides that he would go say hello to the renowned artist and thank him for the opportunity then take off. What good is studying with one of the modern greats if you cannot actually apply the lessons learned? On his way, Arik stops at a gas station close to his destination. A huge intimidating man comes to fill up his gas tank. Being five foot nothing, Arik has always been scared of men who had some considerable height. However, this man also intrigues Arik despite his fear. Reg Thompson is this man. He is a biker who belongs to the local motorcycle club. While he looks intimidating, he really is a giant teddy bear. He doesn’t mean to scare the cute man and tries to draw him out. He even puts his mechanic into place after the mechanic teases Arik about his height, or lack thereof. After the two meet at a dinner arranged by Ken, the two men begin to talk and find out they have a lot in common. Both are artists who have had to deal with basically absentee parents. Arik grew up with drug addicted parents. Reg’s mother became distant after the death of Reg’s sister and the onset of mental illness. While Reg has dealt with the trouble of his parents, Arik has allowed the problems of his parents to fester. As the two grow closer, Arik meets the rest of the members of Reg’s motorcycle club. While only there for ten minutes, Arik is convinced that Reg is no better than his parents and begins to distance himself from Reg. To make matters worse, Arik’s mother shows up wanting to talk with him. Arik must deal with his past if he wants a future that is happy instead of bitter. 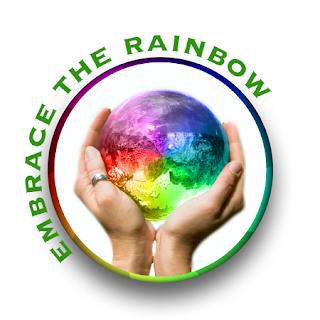 This is the sixth book in Andrew Grey’s Senses series. These books can be read individually but having read the past books brings context to parts of the storyline. I absolutely love this series. Usually one of the major characters, if not several of the supporting characters has a handicap of one kind or another. However, this handicap does not define the character. It is a part of the character like being gay or blond. The most powerful character throughout the series, Patrick the opera singer who lost his voice, speaks the most powerfully. He, along with Ken his partner, help show Arik that he might not be able to paint like he used to, he still could develop other methods of expressing his creativity. The other characters that helps Arik is Bobby Jo, a young girl in the county children’s home who is facing another surgery to fix her malformed hand and Jerry, a young boy from a previous story who is stricken with a muscular disease that has curled his hands. I look forward, as always, to the next book in this series. The cover art is perfect for the book. L.C. Chase has our young blond Arik standing a few feet away from Reg, who is wearing jeans and a leather jacket without a shirt. Reg looks like he is coming out of the bay to the garage of his service/gas station. They are what I thought they might look like. 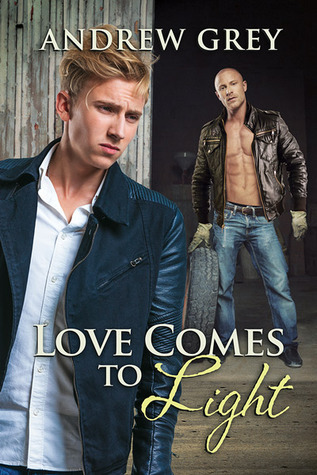 This entry was posted in Book Reviews, Books, Contemporary fiction, Dreamspinner Press, eBooks, LGBTQ Book Reviews, M/M Book Reviews, M/M Contemporary Fiction, M/M Fiction, M/M Romance, Uncategorized and tagged A Paul B HIghly Rated Novel, A Paul B Review, A Paul B Review: Love Comes To Light (Senses #6) by Andrew Grey, author Andrew Grey, Love Comes To Light (Senses #6) by Andrew Grey. Nathan works at the bulk store. He particularly enjoys when one of the regular customers, Vince, comes to buy birdseed for his feeders. He also feels a bit guilty. The reason? Nathan is responsible for Vince buying a lot of that birdseed. He is a squirrel shifter. Nathan’s favorite pastime and obsession is shifting into his squirrel form and watching Vince from on top of the bird feeders. How can he deny his squirrel self some of the birdseed and nuts that happen to be in the bird feeder? It is just an added benefit of watching this hot man walking around in his house half dressed. One day, Vince catches the squirrel sitting on top of one of the feeders. Tired of having the furry creature stealing the seed from the birds. Vince throws a shoe at the squirrel, knocking him down to the ground. Thinking that the little guy is seriously injured, Vince feels guilty and takes the squirrel inside. Getting nowhere after calling a vet, Vince decides to nurse the squirrel back to health. After the squirrel fails to escape through a window, Vince is surprised when Nathan emerges from his squirrel form. Nathan wonders what Vince will think of him now that his secret has been revealed. This was a cute short story. The author brings us a different form of shifter and uses his nature well. 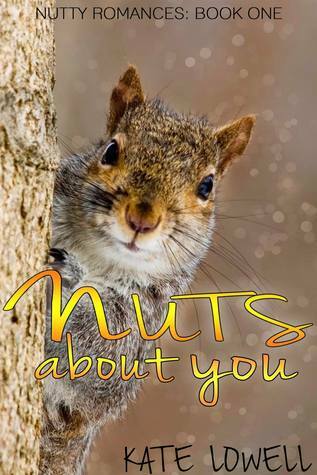 There is a focus on nuts in all shapes and sizes. Nathan is as timid as his animal nature. The scenes once Vince discovers Nathan’s secret are steamy and flavorful. Vince’s occupation is put to good use. The one thing that I did not like about this book is that neither character seems to have a last name revealed. For me personally, I like characters to have full names. It seems to make them more real to me. The cover art by Ana J. Phoenix is quite appropriate. It shows a squirrel clinging to a trunk of a tree. It is a very cute cover for the book. 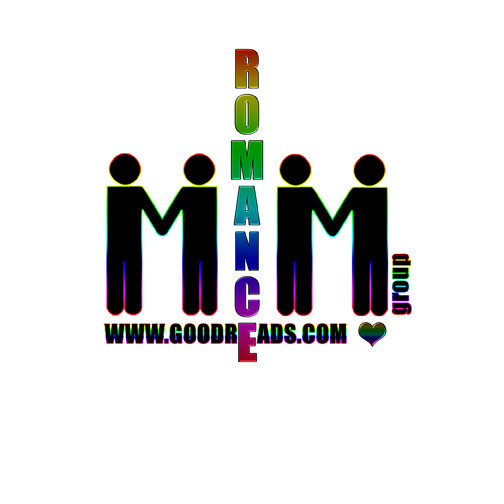 This entry was posted in Book Reviews, Book Tours and Contests, Books, eBooks, LGBTQ Book Reviews, M/M Book Reviews, M/M Fiction, M/M Paranormal Fiction, M/M Romance, M/M Supernatural Fiction, Self Published, Shifters, Weres, Uncategorized and tagged A Paul B HIghly Rated Novel, A Paul B Review, A Paul B Review: Nuts About You (Nutty Romances #1) by Kate Lowell, author Kate Lowell, Nuts About You (Nutty Romances #1) by Kate Lowell, Nutty Romances series by Kate Lowell, weresquirrels. The next day, after guest lecturing for a class at the university, Quentin visits his mother at the hospital. She explains that his father was a fae who was part of the royal family. One of the wolves that has been following him around is actually his father trapped in a spell along with his uncles. Quentin next goes to claim the body of his friend to arrange for burial when he is informed that it is no longer in the morgue. It has walked away. Pissed that a reckless vampire turned his friend, Quentin decides to work for the bounty agency in the hopes of making sure no one else suffers Glenn’s fate. His first assignment is to bring in the leader of the local vampire clan. Quentin marches into the clan’s mansion, casts a spell and transports the vampire to the local police station. The clan’s second, who has now become leader due to Quentin’s actions, thanks Quentin for getting rid of the leader nobody liked. Jakinson, the new leader, states that since the bounty hunter has done him a favor, he owes a favor in return. He gives Quentin a necklace that Quentin would later find out marks him as Jakinson’s mate. Quentin must now deal with a very possessive vampire on top of finding his wayward newly made vampire friend, the rogue vampire that attacked Glenn, and deal with his mother’s declining health and the bills that are associated with her care. If you throw in somebody who seems to be after him, life just got a lot more complicated for Quentin. Amber Kell is one of my favorite authors and this book did not disappoint me. She has a way with books about powerful wizards. 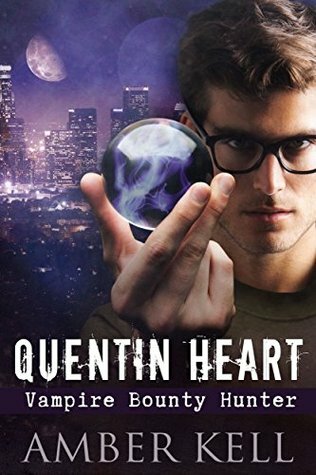 Quentin Heart is your typically preoccupied nerd researcher that has his world turned upside down but circumstances that are beyond his control. He shows his strength in that he makes Jakinson realize that he will not be the submissive mate that most vampire leaders expect. He is faced with some tough decisions that involve his family but comes through them in the end. I also enjoyed the fact that the author has given Quentin enough possible enemies that there should be several more books in the series to come. I highly recommend the first book in this new series. The cover art by Meredith Russell shows our hero wearing his glasses holding one of his spell balls with the city landscape in the background. It is how I would picture Quentin would look like. It is an excellent cover for the book. This entry was posted in 5 star Rating, Book Reviews, Books, eBooks, LGBTQ Book Reviews, M/M Book Reviews, M/M Fiction, M/M Paranormal Fiction, M/M Romance, M/M Supernatural Fiction, Self Published, Uncategorized, Vampires and tagged A Paul B HIghly Rated Novel, A Paul B Review, A Paul B Review: Quentin Heart Vampire Bounty Hunter by Amber Kell, author Amber Kell, first in a series, gay fiction, Quentin Heart Vampire Bounty Hunter by Amber Kell.